On Wednesday we hosted 🏠150 investors at our first Infinity Wealth Investment Network meeting. The biggest and best event I’ve yet to host with even bigger and better events to come. 🙏Thanks to everyone for sharing their kind words and all those who signed up for the iWIN membership. You are getting in on the ground floor of something special and we take your trust in us very seriously. We are the change we want to see in the 🌎world, we are here to help and deliver value and experiences never seen before. Thank you to Charles Wah, Andy Tran, and Steve Ford for sharing their how to’s on small real estate developments, the ideal development investment for beginners. Thank you to Mike Iuliano for sharing his view of the stock markets, how he’s taking that information and applying to his portfolio. And, finally, thanks to my lovely wife and real estate Accountant, Cherry Chan, who is my partner in building Infinity Wealth. Thank you for sharing the taxation challenges of AirBnb’s and short-term rentals. If you have a short term rental, make sure you understand the taxation requirements both in operating and when selling the property. If you missed it, that’s OK, the recordings are available for members. If you want to know more about the Infinity Wealth Investment Network, come check us out! You can register for the event at infinitywealth.ca. Our keynote speaker is none other than best selling author, master of raising capital (and has done so to acquire over 100+ properties), Russell Westcott, aka the JV Jedi. Susan White Livermore, multi-millionaire mom, will also be in the house to share how she continues to get mortgages, event with her portfolio of 35+ properties. It’s not pretty, but the bank makes the rules and they lend us hundreds of thousands, so it’s worth it. The networking of course will be excellent, we had many folks stay over 1 hour after the event to chat. The restaurant for the post-meeting meeting had to give the rest of us the boot, and I took away massive value from the after-meeting meeting. I have been asked many times what is that one thing that is responsible for my success. There honestly is no one thing. I believe the path to success is inch by inch and not by miles. But if you’re always willing to learn, seek out mentors, like the guests on my podcast and the attendees of my events (as they are sharing golden nuggets all the time), then it’s up to you to apply them. 🍻Cheers to all the new iWIN member action takers. Together, we rewrite our histories as it takes a village to raise a 🙌 successful real estate business owner and investor. I am proof of how a network of goal oriented, sharing individuals can be successful and so can you! I first met Anna after seeing a piece by CTV Barrie on how an area student landlord was switching gears and renting to seniors instead (link below). Anna has been in the student rental business for 25 years. After the straw that broke the camel’s back, another abused rental property by the student tenants and thousands of repairs and clean up bills, she switched gears in renting to seniors. 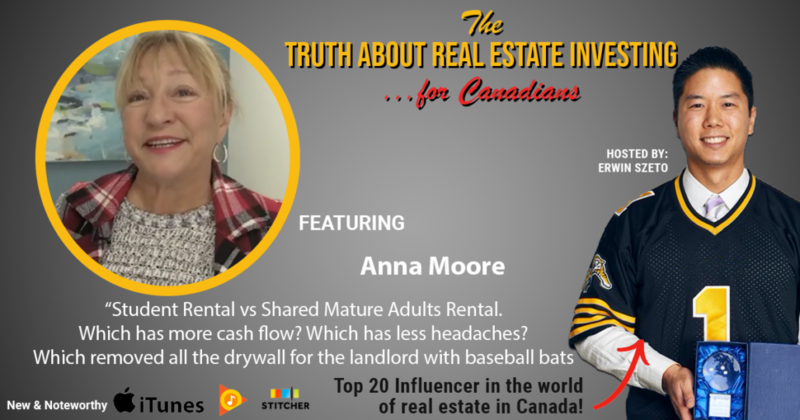 As a student rental investor myself, I immediately reached out to AMR Property Management to speak to owner Anna Moore and here is our recorded discussion. Anna is a veteran business owner with a successful printing company, she currently manages 200 doors (many are her own investments), and she vacations much of the winter in the Bahamas and Europe in the summer. Yet another lifestyle success story for you listeners, as it’s not about the investment, it’s about what our investments afford us in lifestyles, and Anna is living the dream. Plus her business is ever improving as she goes from 5 senior rentals to offering as many as 50 this spring.